Leadership is required to move away from inefficient and harmful fossil fuel subsidies (SDG 12) towards sustainable energy systems with access to energy for all (SDG 7). Fossil fuel subsidies stood at about USD 425 billion in 2015. This is 7.5 times more than the amount of financing required for universal electricity access. Reforming subsidies has massive benefits as a means of implementation for the global transformation towards sustainable and resilient societies. Nevertheless, reform requires efforts from political leaders, civil society and sound information to be successful. This side event presents opportunities for financing and delivering the SDGs through fossil fuel subsidy reform, with a focus on sustainable energy access. Speakers will present replicable strategies for fossil fuel subsidy reform with high benefits for poverty reduction, gender and the SDGs. These strategies include better targeting of subsidies and subsidy "swaps,” which entail shifting fossil fuel subsidies toward sustainable energy solutions like renewable energy and energy efficiency, as well as investments in public transport. The event will see the launch of a report on the interlinkages between energy access and fossil fuel subsidies. The side event is organized by New Zealand on behalf of the Friends of Fossil Fuel Subsidy Reform (“Friends”), with Finland, Switzerland, Sweden and Norway as co-organizers. 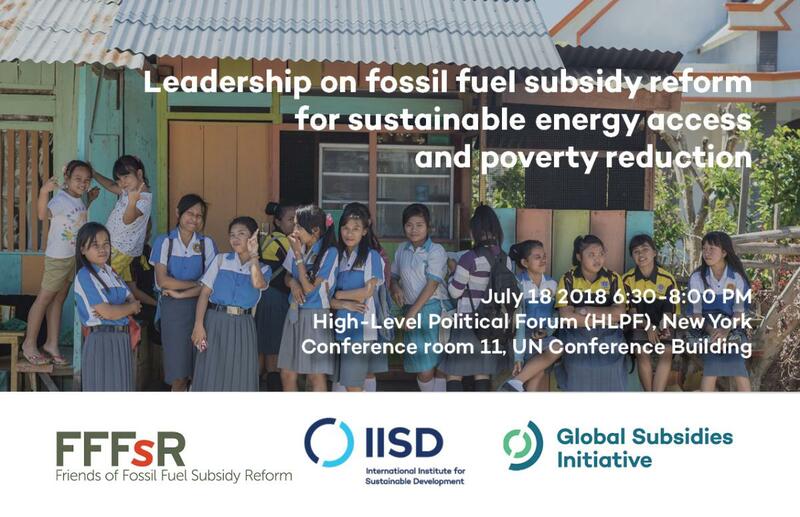 IISD's Global Subsidies Initiative is coordinating the event.